This article contains answers to 11 common important questions that retailer like you may ask before to start up a drop shipping business. 1- What do I need to start a drop shipping business in the US? The costs to start up a drop shipping business will vary according to your situation; in most cases it will cost you about $400 to start up. 2- Does a drop shipper offer customer service and/or talk with my customers? Absolutely No. you are the only responsible for talking with your customers and offer support to them. You will need to do jobs like website building, marketing; customers support, solve problems and deal with any issues that arise. You’ll act as the intermediary between your supplier and your customer. 3- How do I submit an order to a supplier? Each supplier is different. The majority of suppliers allow orders via email. Many will accept orders over the phone; in addition, some advanced drop shippers will accept order online. A few high tech suppliers will even accept orders in bulk via a specially formatted XML or CSV file. 4- What is the turnaround time for fulfilling a drop shipped order? This will vary according to the quality of your supplier, and their location. Most excellent suppliers should be able to process, pack and ship out your order the same day if it’s received by noon their local time. 5- How do I receive tracking info for an order? This may vary by the drop shippers. Excellent drop shippers support tracking information by email in plain text, CSV or XML file. Tracking info should be received as soon as the shipment is processed or by the end of the day the order was shipped. Once you get the tracking number, you will have to give it to your customer typically via your shopping cart interface. One sign of bad drop shippers is the delay in sending you order verification plus its tracking info and/or require you log in to their website in order to get your tracking numbers. 6- How can I pay my supplier? Almost all drop shippers ask you to have credit card on file to pay for your orders. We recommend that you get Visa or Mastercard as lots of suppliers won’t accept American Express or Discover. Once you have great reputation and great relationship with the drop shipper, you will properly be given the option of ‘Net 15′ or ‘Net 30′ terms, which means that the supplier will extend you credit, and just monitor what you owe. Then, you will have to pay the owe amount by check within 15 or 30 days according to the net term you go for. 7-Who pays for the shipping costs on orders? Me or the drop shipper! When drop shippers charge you for an order they will take into consideration the shipping cost. So it is your responsibility to pay shipment fee. Of course you will eventually charge your end customer for the shipping cost you paid. 8- Do orders appear like they sent directly from my store? Absolutely yes! And this is one of the coolest facts about drop shipping business model. Your company’s name, logo and your return address will be shown on the packing slips as well as on all invoices. So it is 100% as if the order was sent directly from your own store. 9- How do returns from customers work? Most drop shippers will put restrictions on what is allowed to be returned. Thus you are advice to communicate with the drop shipping company to discuss return from customer rules. Most suppliers will provide you with a unique number called RA (Return Authorization) which will identify the returns in their system. Once received, simply pass along this return authorization number side by side with the address of the warehouse to your customer. When the supplier gets the return, they will send you a notification along with a credit invoice showing that they’ve credited you for the return product. Then, you will then refund the customer who bought from you. 10- Who will pay the shipping cost of returned item? For Defective products: Andrew said If a customer received a defective item, he feels it’s his responsibility to pay all the associated costs to get them a new proper item. While some store owners will argue that they did not make the product and so it is beyond their responsibility. Andrew thinks that will be a poor way to do business, and provides a very bad experience for your customer. Andrew recommends paying for the return shipping costs incurred by the customer to send back the item, as well as the costs involved with shipping out a new replacement. In the event the product is very low-value (costs $20 or less). Andrew himself often ships a free replacement without asking the customer to return the old item. This is often easier, faster and cheaper. He said. The good news is, if an item is genuinely defective, most wholesalers will pay for the shipping cost of sending out a new one. That means you will only need to cover the cost of shipping from the customer to the warehouse. For Non-Defective Products: If the customer decides to return a product because of wrong selection or because they basically changed their mind, then they will often be responsible for paying the return shipping cost. However, if the item was improperly advertised or presented on the store website, the business should pay return cost if this was the cause of the problem. 11- Do drop shippers ship internationally? This differs by drop shipper, but approximately half of the drop shippers support international shipping. You have to discuss this with the company you are intended to work with. Please keep note that if an international customer receives a defective item, getting them a replacement will be significantly more expensive. Also the possibility of fraud and abuse increase with international shipments. 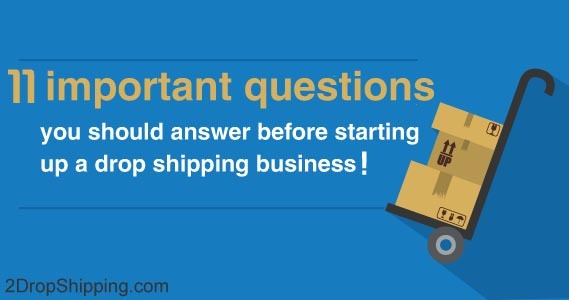 Finally, what things you know must be discussed before starting up new drop shipping business, please write your comment below and do not forget to share the post with your friends. 11 important questions for any drop shipping business!